Is it time for you to change jobs? 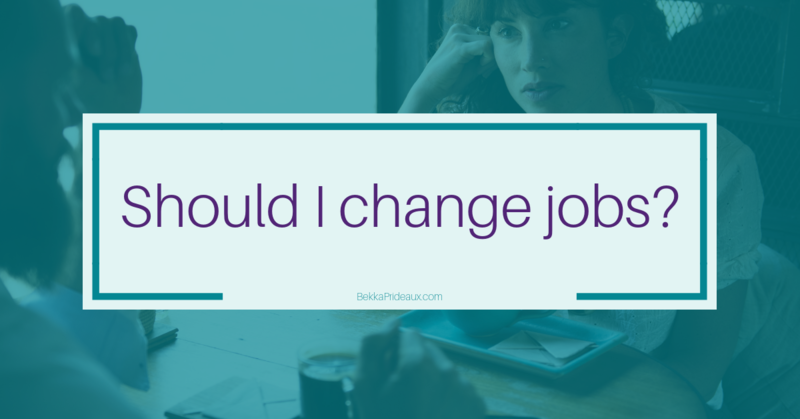 If you find you are asking yourself ‘Should I change jobs?’, is it time to move on, or can you make changes which will help you love your job again? Here are some questions which will help you decide. From time to time, we all find ourselves wondering “should I change jobs?” It can happen when things at work are going badly, or even when they are going really well. It can happen when we see other people moving on, or when someone tells us about an exciting new opportunity. So when that feeling strikes, how do you decide if you should start looking and take that leap? There are many, many factors that are going to form part of your decision. So, instead of the broad issue of “should I change jobs?”, here are some more detailed questions that will help you work out what is best for you. 1. What's causing me to think about changing jobs? This question is first for a reason – its answer not only guides your decision right now, but also shapes what your next steps are going to be. Is the way you are feeling the result of a bad day or has it been gradually building up for a while? One of my favourite ways to get to the heart of this is to consider how it feels when you think about walking into the office. Noticing how you react both physically and emotionally will give you some very valuable information on which to base your decision. Additionally, you may want to consider how you feel about the company, what they do and how it feels to work there. How well do you get on with your colleagues and, very importantly, your boss? As leaders, we are the lens through which our teams see the company, but we also look through the lens provided by our own bosses. Then there is your work. Does it motivate you? Are you rewarded adequately? Is your contribution recognised? Are you still learning and growing in the role? 2. What am I really looking for in my career? Getting clear about your career motivations and aspirations will allow you to decide if your long-term future fits with the opportunities and possibilities in your current situation. There are many ways to define and understand your career motivations, and a good place to start is to think about the times you felt best about your work. What do they have in common? Typically, career motivations are made up of factors such as recognition (among your peers, through fame or financial reward), social interaction, independence, creative expression, intellectual challenge, helping others, the need for stability and the need for variety. Knowing which of these motivations matter most to you will allow you to measure both your current role and any potential future roles against your ideals. You may find you don’t need to change jobs to make that career happen; it may be possible to make some changes where you are and get everything you need. Does your organisation have the scope and space for you to grow, both now and in the future? New opportunities are easier to find in an organisation that is growing and changing. 3. What are the practical implications of my job? Like it or not, our careers do not operate in a vacuum. When we are deciding if we should change jobs we have to consider the practical elements of our working world. Do they work for you or do you need to make some changes? Two of the three most commonly cited reasons for changing jobs are practical things: pay and conditions. The third is career progression, which we considered in the last question. Where do you stand on the first two factors? Do you feel you are paid fairly for the work you do? Does your role give you the financial and other rewards you need and consider reasonable? Do the conditions suit you? Do the hours work for you or does the work spill into the other areas of your life? Is your work commute what you consider reasonable? How does your role fit with your other life commitments, your family and your hobbies? Does your role give you the flexibility you want or need? Collating your answers to all these questions and noting all the things that occur to you while you do so will give you the basis to make a balanced and good decision next time you ask yourself “should I change jobs?” Do the pros of moving outweigh the cons, or would making some changes to your current role and relationships leave you loving your job again? Answering these questions is not always straightforward but working with a leadership coach can help. Check out my Your Next Career Chapter package and book an initial free consultation.